Phil started his singing career in the 1970s with Lancashire Folk Group THE TACKLERS, and went on playing through the 80s with Lancashire legends FLASH COMPANY. In 1989 he started the Irish band WHISKEY IN THE JAR who still pound the motorways of the UK today, some twenty four years later. Brendan spent his early days playing and singing with the Manchester based ST. MALACHY'S CEILIDH BAND, moving on to join SAVING THE TURF. He joined WHISKEY IN THE JAR in 2009, adding his own collection of Clancy Brothers songs to the band, along with playing the banjo, mandola and bodhran. 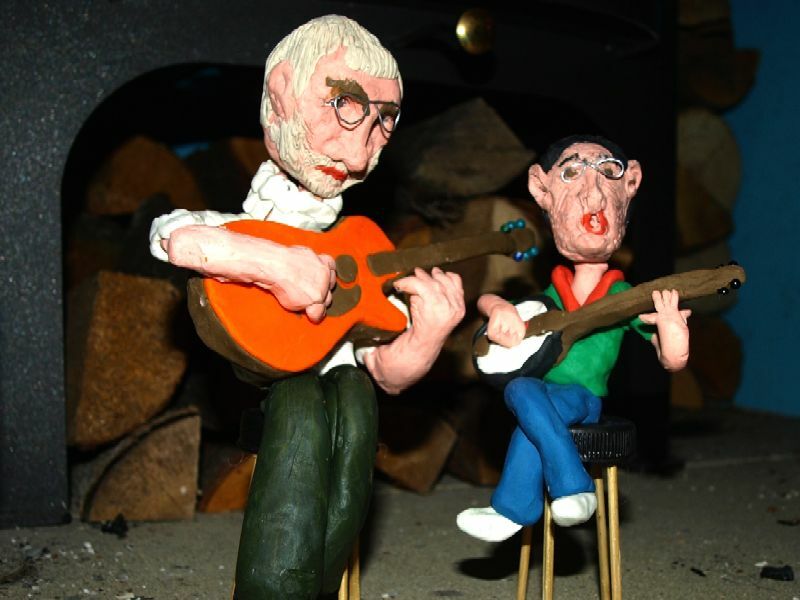 On their nights off from playing with Whiskey in the Jar, Brendan and Phil perform as the duo MASON'S APRON, enjoying the atmosphere created in the folk clubs and small pubs where they ply their trade. Mason's Apron recreates the mood of the 1960s and 1970s when the Clancy Brothers and The Dubliners first brought Irish music to the notice of the world. The duo's style is completely non-pretentious, it is all about the story and the song, and about entertaining the audience. The duo's performances include wherever possible the audience, so if they arrive with a tune or a song then they are welcome to join in with Mason's Apron on stage. Where do we start... and where do we finish?! All for mi Grog, The Auld Triangle, The Banks of the Roses, Black Velvet Band, Blarney Roses, The Bold O'Donoghue, Boolavogue, Brennan on the Moor, Bucket of the Mountain Dew, Carrickfergus, Courtin' in the Kitchen, Dirty Old Town, Fiddlers Green, Fields of Athenry, I'll tell mi Ma, The Irish Rover, Whiskey in the Jar, and maybe another 60-70 if we have time for them all. ...it starts when you book the duo of Brendan Comer and Phil Taylor, who together perform as Mason's Apron. Once you've booked the duo, you just tell all the musicians and singers you know that they are free to join us for the evening. We call it an "Irish Gig-a-long Night". It could be the best night of Irish music you have experienced. And if you don't have musicians and singers of your own, then we can bring the rest of Whiskey in the Jar with us.